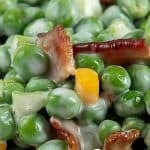 ‘Eating your peas’ has never been easier! 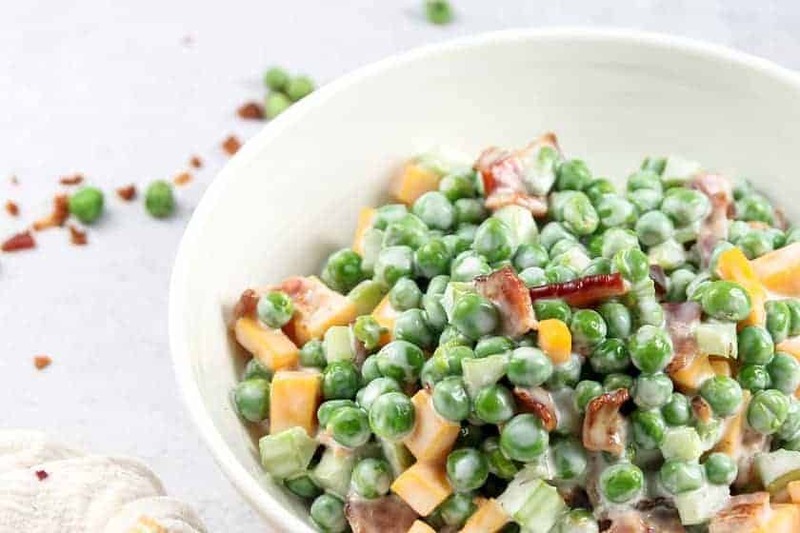 Your family is going to love this classic, creamy, chilled pea salad. And don’t be surprised if your family will be asking for seconds! 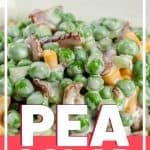 How to make pea salad? Start by defrosting the frozen peas. The fastest way to do this (without a microwave) is to spread them out. I like to cover a large baking sheet with some paper towels and spread the frozen peas. Allow the peas to thaw completely. You can also defrost the peas in the microwave, but I prefer to slowly let them thaw out naturally. We have a gas oven at home. And a simple trick, I’ve found is to put the baking sheet with the peas on top of the stove while the bacon is cooking. The heating coming from the oven will help the peas thaw in no time. Meanwhile preheat the oven to 400°. Use wire rack and place into a large baking sheet. Cover the baking rack with parchment paper and place bacon on top. Once the oven has preheated, cook the bacon for about 15 minutes or until crispy. 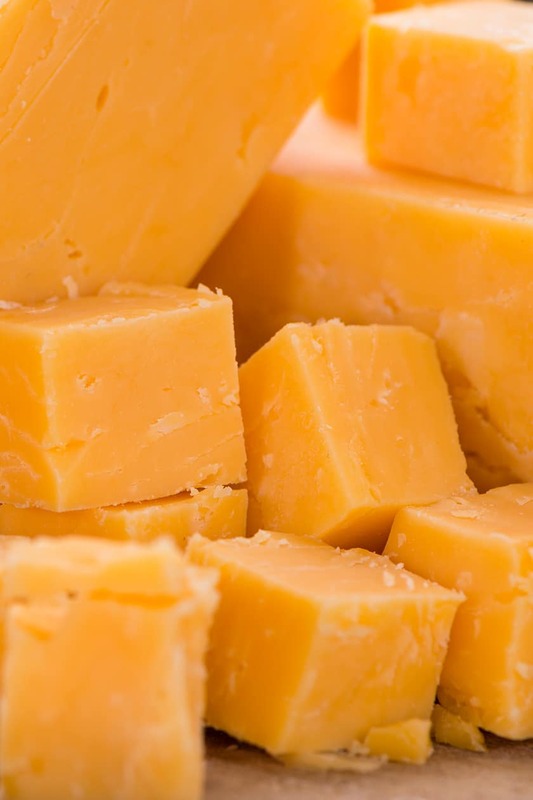 Once the bacon is cooking and the peas are defrosting, cut the Cheddar cheese into roughly 1/4 inch cubes. Next chop the celery. Set it aside. Once the bacon has cooled, chop it. I like to have both small bacon bits and large pieces of bacon. 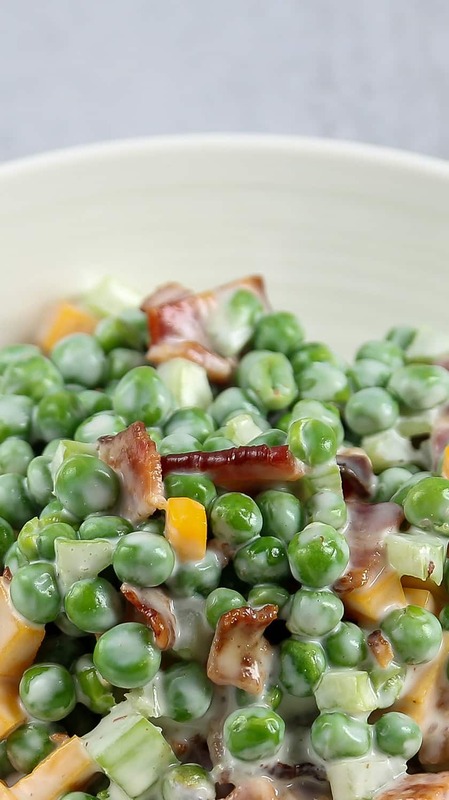 Add the defrosted green peas, cooked bacon, Cheddar cheese, and celery into a large bowl. In a separate bowl combine sour cream, apple cider vinegar, and sugar. Season to taste with a bit of salt. You can add black pepper, but I don’t think it is necessary. We’ve been there, you have almost everything in your fridge or your pantry, except for. Don’t sweat it! Here are some simple substitutions that will all work quite well when you’re in a pinch! Red onions work great instead of celery. And instead of bacon you can use pancetta or even prosciutto. 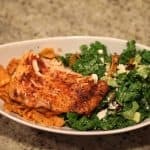 Plain or Greek Yogurt instead of Sour Cream. It has the added benefit of saving you some calories, too! Use mashed avocado instead of mayonnaise. You can use lemon, or white wine vinegar instead of apple cider vinegar. Use maple syrup, agave, or Stevia instead of plain sugar. Like most salads these day, I like to store green pea salad in a glass bowl. Lately, I’ve become obsessed with glass storage containers (check out Costco for some great deals!) 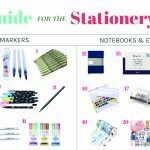 and pretty much store everything in them. But if you’re traveling, plastic containers like these will work very well. How long Does The Salad last in the fridge? This salad will keep great overnight. 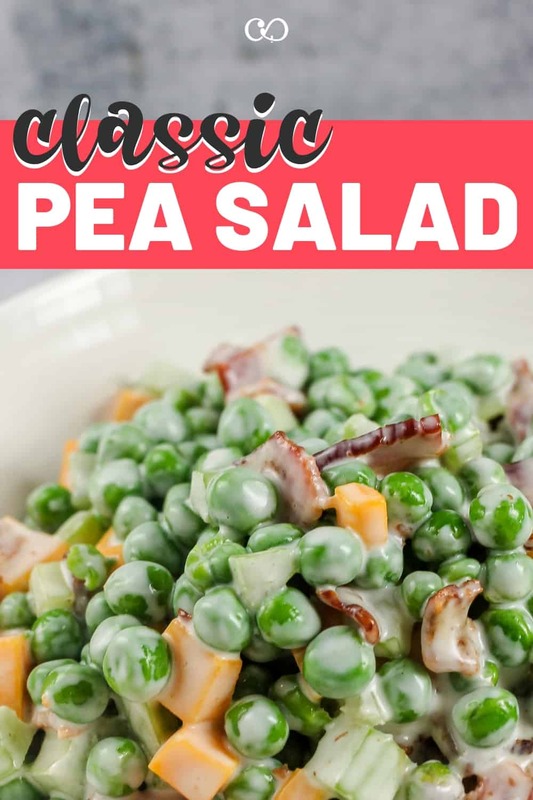 But don’t keep the pea salad for more than a day or two. 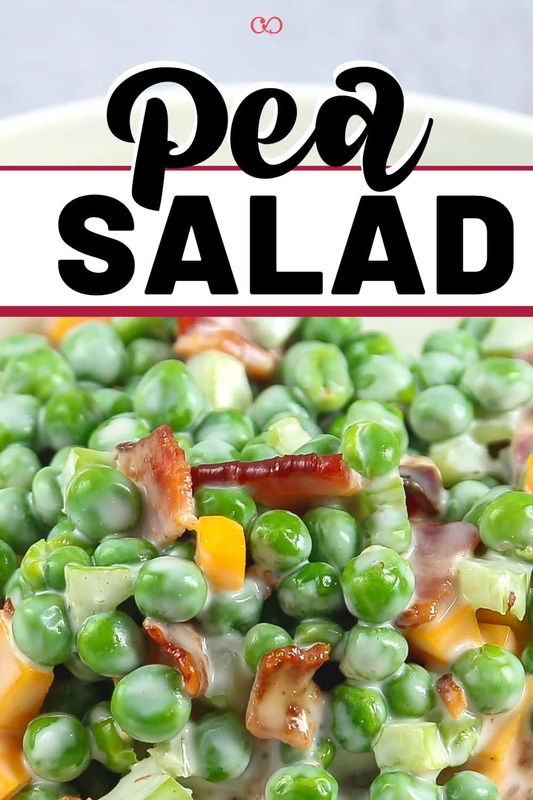 The dressing will make the bacon soggy, and the celery less crunchy. 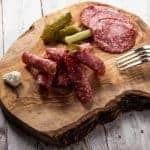 What if you want to prep the salad for a party? 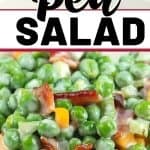 (Pea salad is a great party salad!) 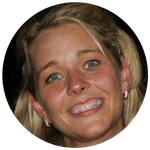 Ready to wow a party crowd? No problem. 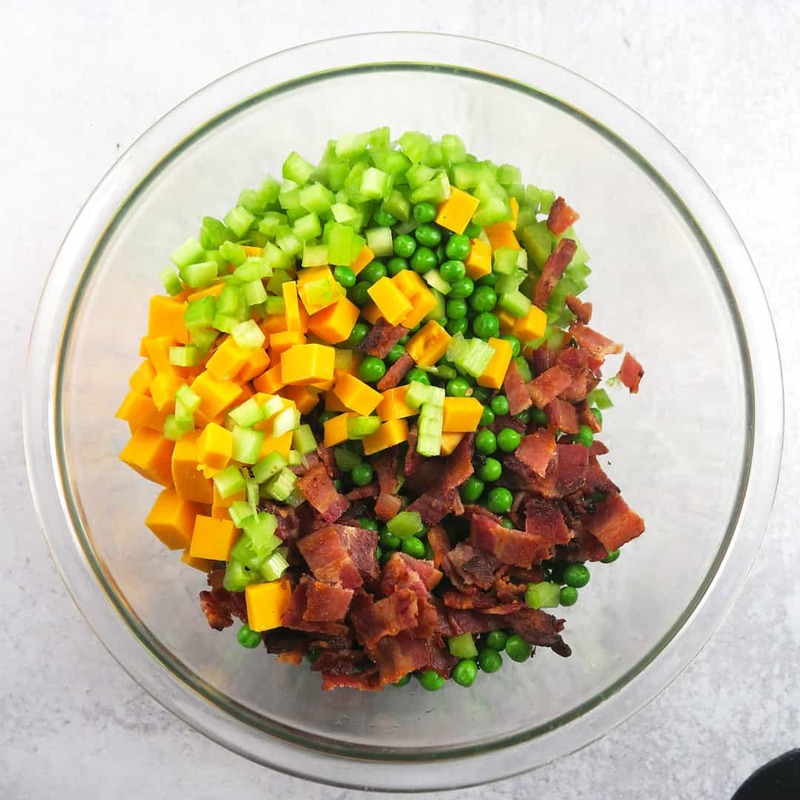 Simply add all of the ingredients, except for the bacon, into a large bowl. Cook off the bacon, but store it in a separate container. Finally, add the bacon just before serving the salad. 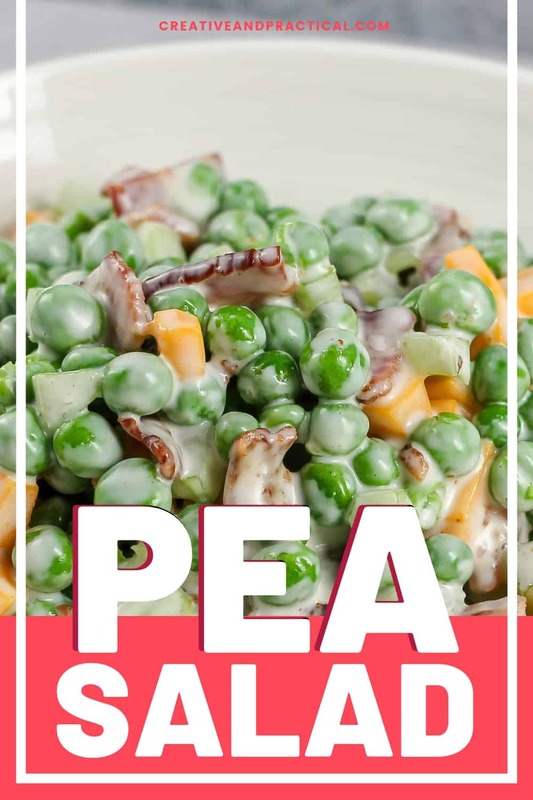 This way you’ll make sure to give your pea salad that extra little bit of crunch and texture. 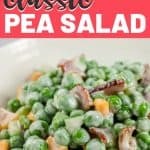 Simple, classic Pea Salad. Perfect for a midweek dinner. Take a large baking sheet, line the bottom with aluminum foil. 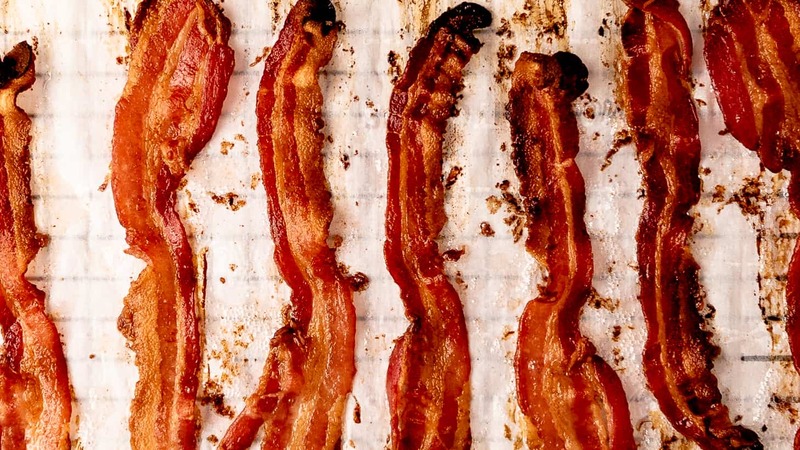 Add a large wire rack into the baking sheet, top with parchment paper, and add slices of bacon. Once the oven has reached the desired temperature, add cook the bacon for 15 minutes or until the bacon turned crispy. 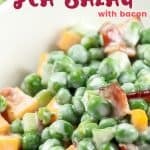 Allow the bacon to cool and cut into small bite-sized pieces. Use another large baking sheet and line with paper towels. Evenly spread the frozen peas and let them thaw. Meanwhile cute the Cheddar cheese into roughly 1/4 inch pieces. Dice the celery into bite-sized pieces. For the dressing combine sour cream, mayonnaise, apple cider vinegar, and sugar in a small bowl and whisk together. 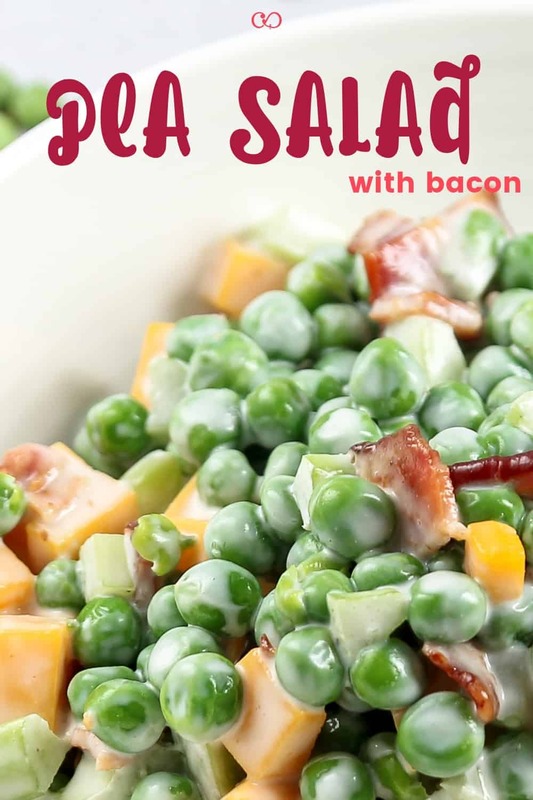 Combine thawed peas, bacon, Cheddar cheese, and celery in a large bowl. Add dressing and combine. Serve and enjoy. 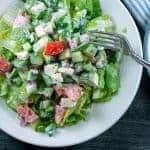 If you’ve tried this salad recipe, and I’d love it if you’ll leave a comment and share it with your friends and family on social media! What a great salad idea. I made this last weekend and it turned out great. 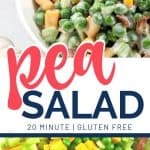 I desperately needed to make room in our freezer when I came across this pea salad recipe on Pinterest. Even our kids loved it! Will definitely make again! I’m so happy to hear it worked out for your family!